The Music Program is an energetic, dynamic, and engaging experience for students passionate about both vocal and instrumental music. Within our ensembles, students will have the opportunity to develop and refine their technical and musical skills through the rigorous study of jazz, classical, and popular musical styles. Windward music students receive the finest and most dynamic instruction in a secure and nurturing environment. Peruse a comprehensive list of music courses at Windward below. The Advanced Jazz Ensemble is designed for our most serious and talented musicians as a chance for them to explore their artistry. This class focuses on deepening their skill level in improvisation, composition, performance, and teamwork at an advanced level. 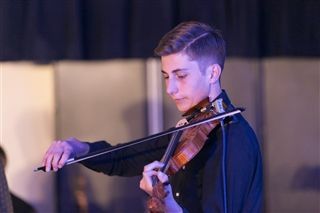 The Advanced Instrumental Ensemble is geared for students who are seeking to further build their musical skills learned at the Beginning and Intermediate levels in order to step up to the higher level ensembles. The Chamber Music Ensemble performs a wide variety of music including Bach, Beethoven, Vivaldi, Mozart, movie scores, and more contemporary works. 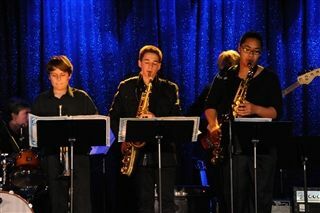 The Windward Jazz Ensemble is open to advancing musical students with at least two years of prior experience. 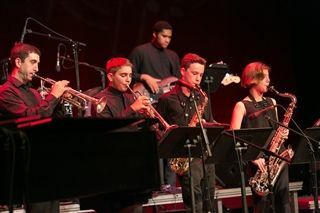 The Jazz Ensemble instrumentation is based on the traditional “big band” and includes saxophones, trumpets, trombones, piano, bass, guitar, and drums. The Beginning Band gives students the opportunity to learn a woodwind (clarinet, flute, or saxophone), brass (trumpet or trombone), percussion, or string (electric bass, violin) instruments completely from the beginning. No previous experience is required to take this course. 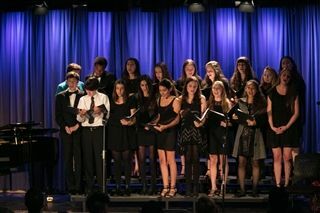 This ensemble continues to set the foundation for future singing at Windward. The class sings a variety of selections ranging from traditional choral repertoire to pop songs to musical theater. Students will learn about healthy habits for singing and the fundamentals of music. This ensemble is for students with a serious interest in singing. Madrigal Singing Ensemble, known as The Chromatics, performs a wide variety of advanced choral repertoire, from classical masterworks to collegiate-style a cappella. The Intermediate Instrumental Ensemble is geared for students who have taken Beginning Band at Windward, or have played an instrument for at least one full year. All incoming students who wish to start with the Intermediate Instrumental Ensemble need to be able to read music at a competent level. 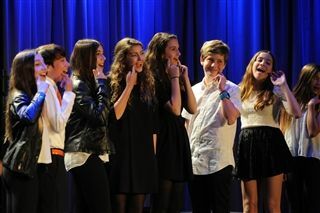 Middle School Singing sets the foundation for future singing at Windward. The class sings a variety of selections ranging from traditional choral repertoire to pop songs to musical theater. Students will learn about healthy habits for singing and the fundamentals of music. Winter Music at the Broad 2018 from Windward School on Vimeo. Dr. Bruce Eskovitz has performed and recorded with many great and diverse artists, including Joe Cocker, Natalie Cole, Freddie Hubbard, Doc Severinsen, Joe Williams, Rosemary Clooney, Jimmy Webb, Bill Watrous, Elliot Smith, Dwight Yoakum, Jane Monheit, The Fifth Dimension, Rita Moreno, Jack Jones, Bobby Vinton, Shari Lewis, Ernie Watts, and many other celebrities. 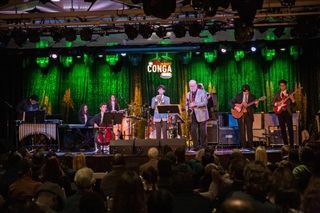 In addition, he has recorded six albums as a leader and currently fronting his band BEJO (Bruce Eskovitz Jazz Orchestra) featuring some of the best jazz musicians in Los Angeles. His most recent album, Invitation, was among the top 100 Jazz CD’s receiving radio play in 2008. He is also active as a producer/composer contributing to the The John Davidson Show, The Danny Gans Show, The Ebony/Jet Celebrity Showcase, the ABC TV show Santa Barbara, Ollie Mitchell's Sunday Band, Frank Capp’s Juggernaut, and "The New American Orchestra." Dr. Bruce is the Area Head of the Music Program at Windward School and holds a Doctor of Musical Arts degree from the University of Southern California in Jazz Composition, a Masters degree in Jazz Studies from the University of Southern California, and a Bachelors of Arts degree in Music from California State University Northridge. Lisa Weinstein started playing violin at the age of five. She began learning with the Southern California Suzuki Program and since has gone on to study with renowned Professor Abram Shtern. Lisa graduated with both her Undergraduate and Master’s degrees from Manhattan School of Music Conservatory studying with Patinka Kopec. Ms. Weinstein has played in various orchestras including the Santa Barbara Symphony, the Santa Barbara Opera, the Pasadena Orchestra, the Los Angeles Philharmonic, and the Huntsville Symphony to name a few. She is an active chamber musician and has made solo appearances throughout the United States, Europe and Mexico. Ms. Weinstein is currently a freelancer in the Los Angeles area and has played on many motion picture and popular CD recordings. She has played with such artists as Tony Bennett, Kanye West, and Susan Boyle. Dr. Daniel Koh is an active choral director, music director, singer and pianist in Los Angeles. He received his Doctor of Musical Arts and Master of Musical Arts degrees in Choral Conducting from the Yale School of Music and his Bachelor degrees in Music and Biology from Westmont College. He has conducted high school, middle school, college, professional, community, children's and church choirs in California, Florida, Washington, Connecticut and his home country of Singapore. He has also toured internationally with the Yale Glee Club Chamber Singers. Here in Los Angeles, he was one of the founding members of the Contemporary Choral Collective of Los Angeles (C3LA) and he has music directed and performed in many productions at the Morgan-Wixson Theater in Santa Monica, among other venues. To purchase CDs or DVDs of Windward Performing Arts groups, please contact Lisa Weinstein. Join the Spirit Band and be a part of what's going on at Windward. Spirit Band members gain community service credit while having a great time performing at games and school events. Talk to Dr. Bruce for details.